Our Espresso Bar reflects our unending commitment to provide superb espresso based drinks. The blends that make up our espresso are developed for the sole purpose of achieving a unique espresso experience. On some occasions, just the right single-origin espresso can also become part of our espresso offerings. The development of a great espresso can only occur when all the details from seed to cup are evaluated for their ability to produce a unique flavor profile. Its synergy with milk is also very carefully measured. Our espressos are prepared with purpose, balance and in adherence to the standards developed by the Specialty Coffee Association of America (SCAA). Our artisan coffees are brewed using various methods that enhance their flavor. 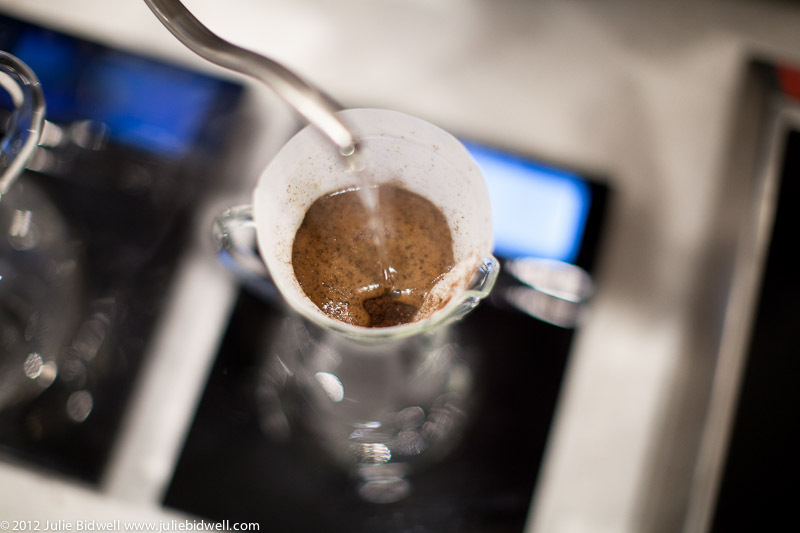 Our brew methods include all major pour-over methods including Kalitta Wave, Chemex, as well as Siphon Pot and French Press. We measure our coffee-water ratios, beans, our grind, and our water temperature. We also take into consideration the Soluble Yield for an optimum flavor experience. The brewing process does not conclude until the flavors are at their peak. Our Baristas spend countless hours perfecting their skills, understanding the unique qualities of each bean, and making each cup special. This cup is complex and silky smooth, with white grape acidity and dessert sweetness. Pour over showcases notes of cherry, pineapple, banana, mixed berries, caramelized sugar, and cardamom spice that coalesce into delightful fruit cake, particularly as the cup cools. French press develops a complimentary weighted body and enhances pleasant notes of chocolate, berries, fig and nougat. Pablo Yana Mamani cultivated this coffee on the high planes of Bolivia, in the Caranavi region of the Andean Altiplano. Like most farmers in the region, Pablo Yana strives to produce better coffee every year; but he is also driven by his success at the 2007 Cup of Excellence competition and the support of his family and cooperative. The shady and high altitude Bolivian terrior are ideal for coffee development, but what makes this coffee excellent is Pablo Yana's high production standards and clear devotion to quality. Ripe coffee cherries are hand-picked and wet-processed at his farm, and then washed and fermented at the San Ignacio Beneficio or wet mill. Samples from all his lots are cupped to ensure quality and growth, and only the best coffees are incorporated into this microlot. During Yirg-Z, zero defect processing, coffee seeds are meticulously hand sorted to ensure a complexity and clarity that truly speaks for the labor, skill and care taken by the various skilled farmers that contributed to this lot of coffee. "...rooted in the tradition and simplicity of artisan baking..."
We take great pride in our in-house creations, as well as partnering with individuals who understand the importance of creating extraordinary food items that will truly compliment your coffee experience. Our sweet and savory pastries are rooted in the tradition and simplicity of artisan baking practices that are beautiful to behold, even better to taste.